What was a much better day for birding was surprisingly quite, the only noteworthy sightings in winter terms were an adult Lesser Black-backed Gull in Nouster Bay and a first-winter Little Gull at the airfield. All of which was more than made up for by a fine and lengthy display of the Northern Lights. Apologies to those who log in just for the pretty pictures, we are trying but it's never quite photography weather during February. A Grey Plover had joined the Green-winged Teal on Gretchen Loch and the Canada Goose was still roaming amongst Greylags, but the surprise arrival was a male Stonechat at Purtabreck. Both male and female Hen Harriers were seen at Viggay and a Merlin was chasing a flock of 26 Twite at the Bird Observatory. Not a huge amount to report but a smart first-summer Little Gull was on Brides' Loch amongst 61 Common Gulls. 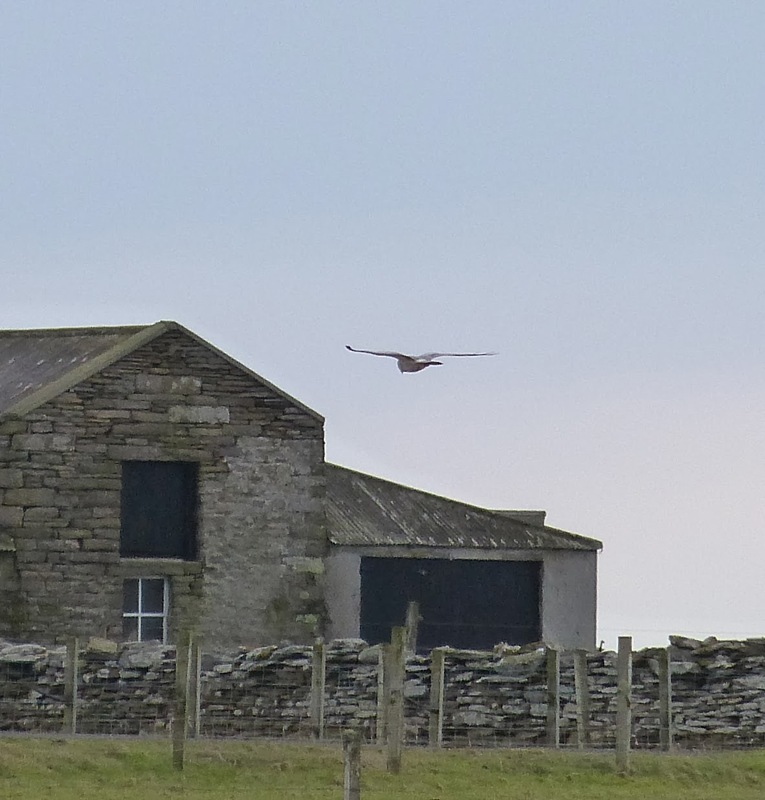 Two each of Rock Pipit and Skylark came in off the sea there and a further 14 of the latter flew south. The Canada Goose was by Holland and last weeks Iceland Gull was still at Neven. The first Pied Wagtail of the year was seen near Purtabreck, but there was no sign of either the Glossy Ibis or Green-winged Teal. The majority of interest is currently amongst the many Greylag Goose flocks with singles of Pink-footed, Tundra Bean and Canada Goose plus the 6 White-fronted Geese. There were now 3 Grey Herons at Ancum Loch where the male Hen Harrier was seen hunting Snipe. A trickle of 19 skylarks through the day was encouraging. The Green-winged Teal had relocated to Bride'sness Loch which held good numbers of wildfowl including 9 Red-breasted Mergansers sitting out from the rough seas, 4 Pintail, 14 Gadwall and a Little Grebe. A first-summer Iceland Gull patrolled the coastline there and nearby were 6 White-fronted Geese. Passerines were still hard to locate with just 7 Twite and 14 Skylark at Kirbest and 9 Snow Buntings on the shore near Howar. Double figure counts of Fieldfare kept a male Hen Harrier and a Merlin busy. Despite not being seen by Observatory staff, we're told the GLOSSY IBIS has been seen regularly early morning near Ancum in recent days. The Green-winged Teal remains faithful to Gretchen Loch and just a single Bean Goose was seen near Milldam. Small numbers of thrushes remained including a Song Thrush trapped at the Bird Observatory and two Grey Herons were at Hooking Loch.